If you live near the coast, this is the best Lomandra for salt laden winds, but even if you live inland you should still consider Nyalla® Lomandra. It looks like a grass tree with out a trunk. Its foliage is almost always clean looking, it stays evergreen even under heavy frost and its drought tolerance is legendary. This one here (just above) is fully grown and has stayed evergreen without ever having pruning for 7 years. No wonder it’s so popular. Nyalla® Lomandra works well all over Australia except in humid parts like Queensland. It’s a great soil stabilizer for slopes and it handles most soil types, even very sandy soil types. Nyalla® Lomandra works well in full sun to part shade. It’s definitely one of the most reliable landscape plants around. Ideal for mass planting or as a specimen plant like this one above. SunGold™ Lomandra is one of those drought tolerant, no fuss, easy care reliable plants. The variegation on this Lomandra longifolia is subtle, yet its golden colour provides rich contrast for any garden. 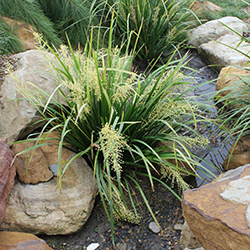 This tough Lomandra works well in cold climates such as Canberra, but also in hot dry zones. It will even cope with the humidity of South East Queensland, provided the soil is not heavy and periodically wet. Ultimately it will get 600mm high, but can be pruned each few years to keep it lower if you want. So go for gold, go Sungold. Lomandra longifolia ‘Katrinus Deluxe’ is one of the most drought tough plants in the world. Not only has it got a finer leaf than most Lomandra longifolia, but it also flowers more. Look at the masses of yellow flowers on these plants. 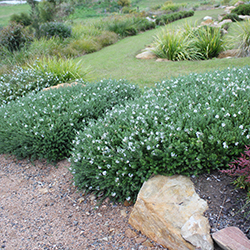 Katrinus Deluxe tolerates most types of soils, and is more frost tolerant than most Lomandra types. In more humid regions it is best to avoid using this plant in periodically saturated soils, or depressed areas. In non humid areas this is not a concern. Katrinus Deluxe handles full sun and moderate to slightly heavy shade. It is widely used as a Roadside plant in Australia, New Zealand and the USA due to it’s toughness, its low maintenance, its evergreen habit, and the fact that it will not produce seed. It is an excellent erosion control plant. These Katrinus Deluxe have been in for many years, and have never been pruned, and this is about as big as they get.